Readers ask questions about the text and the author's intentions and seek information to clarify and extend their thinking before, during and after reading. Ask questions to understand what I'm reading. 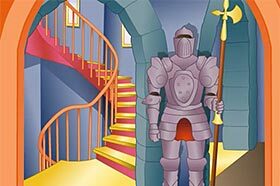 Students travel through a castle as they ask questions about texts during this activity. They may choose Middle Eastern folktales or non-fiction texts about castles. The students' questions act like keys, opening doors and letting them go deeper into the castle and the story. 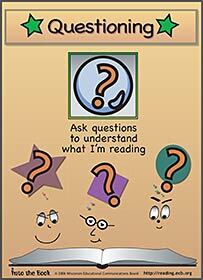 They also answer their own questions if they are able, and group them into "In the book" or "In my head" questions. In this episode, Mrs. Pingel uses a National Geographic magazine to model the questioning strategy. During a science lesson, Kamilah's own questions pull her into her Ranger Rick article about otters, where the otters themselves help her answer her questions. She later uses her new questioning skills to help a frantic zookeeper.